MUGEN Shinden Ni, the 2013 contender for Team MUGEN and John McGuinness in this year’s Isle of Man TT Zero event, has been running a series of tests in Japan in preparation to being shipped to Europe to tackle the gruelling 37.76 mile mountain course on June 5th. 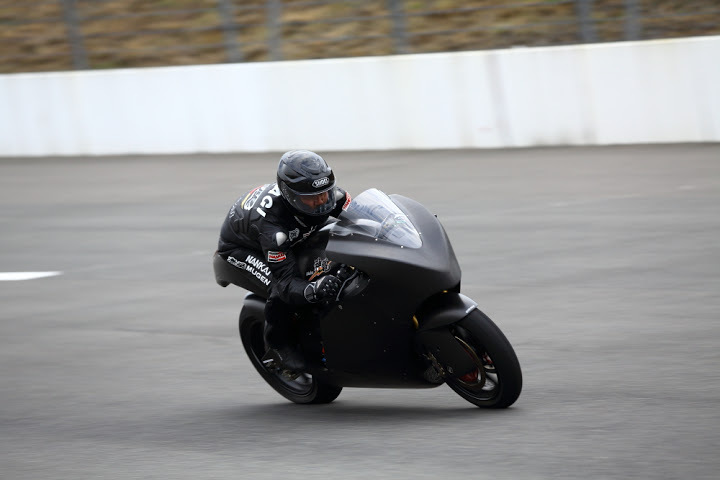 The 2013 all-electric powered machine, seen sporting interim bodywork, will be looking to build on the successful debut for MUGEN in 2012 where the team were among the first to break the elusive 100mph lap barrier for electric racing bikes, with an impressive 102.2mph lap earning a 2nd place finish. With initial tests designed to prove the speed and endurance of the all-new chassis and power-train the team declared progress to be well on target, and work will continue to finalise the bodywork and complete the build before MUGEN Shinden Ni begins the 5,900 mile journey, which the team hope will end in a trip to the top step of the TT podium for 19 times TT winner, John McGuinness.